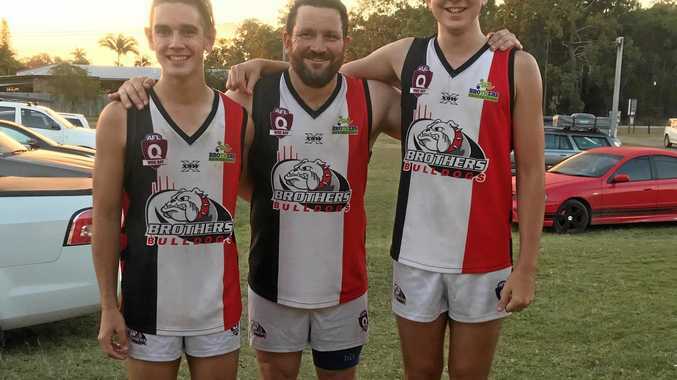 AUSSIE RULES: As Ben Turnbull led Brothers Bulldogs on to the field against Maryborough at the weekend he was filled with a sense of pride not felt before in his 24 years of senior football. Because, for the first time he played a game with his two sons, Luke and Joeseph Turnbull, in the Wide Bay AFL, and it was a memory Turnbull will hold close. "When Joe was born 15 years ago I jokingly said to my teammates that I'd play football with him and Luke one day,” Turnbull said. "I've watched them from their time at Auskick, then junior footy, and now I have played a senior game with both of them. The true sense of how far his sons have come in the game dawned on Turnbull as he pulled his boots on before the memorable match. If you look closely at Turnbull's socks when he plays it is clear they are too small. This is because the socks used to be worn by Luke and Joeseph when they were just boys playing junior football, and they are a token Turnbull looks to before each and every game he plays. "Years ago my matching socks were 'borrowed' by Luke and Joe from time to time,” he said. "I ended up with an odd pair of theirs, but I don't mind at all because each time I wear these now I think of Luke and Joe. Luke said he recalled the first time kicking the footy at Auskick as his dad watched on and now words couldn't explain how it felt to walk out onto the field with both his dad and younger brother. While, Joeseph said it was amazing to be in the senior side with his older generations. "My dad is a role model for me and I am always looking up to him,” Joe said. Brothers will have no time to reminisce on the weekend's game when it plays another must-win encounter as the Wide Bay AFL season draws to a close. Sitting in fourth place on the ladder the Bulldogs need to beat Hervey Bay to secure a place in the finals series. A loss could see the team play its last game in 2018. Turnbull knows the importance of the game, and said while other matches could alter the course of the team's season it is of no concern to the players. "For the past three games we had to win, or our season would have been over, and each week the team has done what it needed to,” Turnbull said. Gritty wins against Bay Power and Across The Waves started the Bulldogs three-game winning streak, and victory against the Bombers could give real momentum leading into finals. Brothers have spent the week on the training paddock refining its game style, which has served it well over the past three weeks, and the Bombers will provide a test to see if that game style is good enough to handle finals football. The Bulldogs play Hervey Bay at 3pm tomorrow at Brothers Sports Complex while ATW travel to take on Gympie in what is another must-win game for the Bundaberg team.